"I am not an animal! Well... okay, I'm kind of an animal. My features are animal-like, I don't wear clothes, and I smell a bit outdoorsy most of the time. But I have a job, and I talk and stuff too, so when I say I'm not an animal I think technically I'm on solid ground." They're animals who think, talk and act mostly like human beings. Unlike the Speech-Impaired Animal, Talking Animal, or Civilized Animal (whose priorities and motivations are still that of an animal despite their ability to speak), the Funny Animal has almost all the mannerisms of a human being. Sometimes, only his appearance distinguishes him from the hairless primates who draw him. Indeed, one of the main incentives in using such characters are that they are more distinctive, and hence easier to draw as recognizable individuals, than ordinary humans. Or maybe it's just because Furries Are Easier to Draw. A good comparison, from the Scooby-Doo cartoons: Scooby-Doo is a Speech-Impaired Animal. Scrappy-Doo, who might as well be a midget in a dog suit, is a Funny Animal. The main distinguishing trait of many Funny Animals is that in most situations, they can be replaced by a human and the plot would be mostly identical. Unlike Petting Zoo People, which have animal heads and tails on humanoid bodies, Funny Animals have a body that is generally shaped like that of their respective species (or no species in particular). Funny Animals are bipedal even if their species is not naturally so, and most Funny Animal birds have Feather Fingers, whether their wings look completely like wings or look (to varying degrees) like arms. Some Funny Animals can shift between using two legs and four. Funny Animal is the technical term used by cartoonists to refer to the genre and characters. Also note that the "funny" in the title isn't literal: Funny Animals can be serious characters too. Frequently overlaps with Animal Superheroes and Intelligent Gerbil. May live in a World of Funny Animals. May suffer from Carnivore Confusion and Furry Confusion. See Petting Zoo People for characters who are more anthropomorphized, and Civilized Animal and Talking Animal for those who are less anthropomorphized. Borderline PZP have a body that does not look simply like an animal-accented human body, nor does it keep the basic shape of the animal entirely like a Funny Animal. They look partly humanoid and partly like their species, often they have either humanoid legs and non-humanoid torso, humanoid torso and non-humanoid legs, or look semi-humanoid all over. Many top heavy bipedal animal characters are of the humanoid torso and non-humanoid legs variety. Females are depicted with human-like breasts fairly often. In the Furry Fandom, Funny Animals aren't as commonly seen as Petting Zoo People. This is usually because Funny Animals keep their animalistic-shape and lack a few human mannerisms, whereas Petting Zoo People have a mostly humanoid body frame and have full-on human mannerisms. Sometimes, characters who are Funny Animals in their canon will be made Petting Zoo People in fanart, particularly if the artists want to eroticize them. Nevertheless, Funny Animals are fairly popular among members of the fandom, especially to those who like their animal characters to look a little more accurate. On the Sliding Scale of Anthropomorphism, these fall somewhere between the Civilized Animal (Which has some anthropomorphic traits, but still has the lifestyle and priorities of a wild animal) and the Petting Zoo Person (Who have animalistic heads, tails, and sometimes hands). In the anime, Meowth of the Team Rocket trio taught himself "human talk" and how to stand on his hind legs, all for the love of a female Meowth named Meowzie who said that a human could do more for her than anything he could (as in, the food, housing and adoration), only to be rejected as now she considers him a freak. In The Electric Tale of Pikachu, a story arc centers around the kitten of the very same Meowzie; she's found in a Poké Ball the gang purchases (unable to get captured herself, the mother pops her kitten into an unsold ball to ensure that whoever finds her will give her a good home). When Team Rocket, and thus Meowth, come around making trouble, Meowth meets this kitten and instantly sees her mother in her face and shining coin. Then she tells him it's creepy how he acts like he's a human. Oh heartbreak. Mewtwo seems quite human-like, but his psychic powers make that easy. In Pokémon Adventures, he actually has Blaine's DNA and is thus a Half-Human Hybrid. In Studio Ghibli's Porco Rosso (The Crimson Pig) the main protagonist is a pig, or more exactly a "pig-headed" human as he has the complete anatomy of a stout person except for the head. He is the only one of his type and lives among a human society who, while aware of his difference, don't find it bizarre and sometimes openly point it out. It's stated that he somehow became a Baleful Polymorph, given that there are pictures (and a flashback) showing him in human form. Princess Tutu's Mr. Cat looks exactly as his name implies, and occasionally meows and cleans himself with his paws, but is otherwise a marriage-obsessed ballet instructor. While he is the most prominent one and has the most screen time, there are other guest characters that also fall under this trope. Shirokuma Cafe is pretty much about this, as well as their interactions with humans. Inverted with Mr. Shoebill from Episode 8. He does not talk or act anthropomorphosized, but he is still sentient as the Funny Animal characters and is the editor in chief of a local food magazine. Very common in British Comics. Examples include Biffo the Bear and Big Eggo from The Beano, Korky the Cat from The Dandy, Mickey the Monkey from The Topper and Rupert Bear. DC Comics' Captain Carrot and His Amazing Zoo Crew!, which contained several Continuity Nods to the other Funny Animal comics DC published. Mr. Tawky Tawny is a very civilized version of this in the original Captain Marvel. His origin has varied over the years, but he's generally pretty cheerful about being a humanoid tiger living among humans. Conversely, Marvel's Howard the Duck is pretty grouchy about being "trapped in a world he never made!" and is mostly just trying to get by among us weird hairless apes. Finally, Looney Leo from Astro City is a direct expy of Tawky Tawny. A Golden Age theatrical cartoon character brought to life by a mad scientist's machine, he's had a rough time of it, but seems to be getting by okay these days. In Circles, species is purely aesthetic. In the Doctor Who comics, the Sixth Doctor's companion Frobisher is drawn to look like this kind of character, though he's technically a shapeshifter who chooses to take the form of a funny anthropomorphic penguin most of the time. One of the earliest known funny animal characters would have to be Mr.Jack created by Jimmy Swinnerton which ran from 1903 - 1935. The titular duo of Sam & Max: Freelance Police, with Sam leaning slightly further towards being a Petting Zoo Person than Max but still having enough animal coding to be this trope. Some characters, like Sal from the video games, also qualify. Superlópez: The Poet Ant is a humanoid radioactive ant from El castillo de arena (The Sand Castle). The cast of The Great Mouse Detective could be replaced by humans and it wouldn't make any difference at all. Well, except for Toby who is a dog. The cast of Kung Fu Panda. In particular, the characters use their animal attributes in their fighting styles, like Crane's wings or Po's body fat. Tigress and Tai Lung come the closest to crossing over into Petting Zoo People, but they are still distinctly feline. Disney's Robin Hood is the story of Robin Hood but with anthropomorphic animal characters. In Zootopia the basic premise is that human beings never existed and mammals evolved to develop sapience, bipedal locomotion, opposable thumbs, and the ability to speak, ending up as civilized animals with very human-like lifestyles and society but still drawing much more heavily on their animalistic traits than is usually seen with this trope. Guardians of the Galaxy:Deconstructed by Rocket Raccoon. He's a walking, talking raccoon that can stand on two legs and hold heavy weaponry because he had multiple painful experiments performed on him. Brave Story has quite a large population of these. Of course, they're looked down upon by some. Koziołek Matołek. Oddly enough, in the first few illustrations he is apparently an ordinary goat like the others, and suddenly becomes anthropomorphic once he goes on his quest. The nursery characters living in Reading in the Nursery Crime series include bears, tortoises and hares, with the bears at least living in human society (albeit with some prejudice and strict dietary restrictions). The Legend of Podkin One-Ear is a fantasy novel about rabbits. It wouldn't require much of a rewrite to make it about hobbits. Findus the cat in Pettson and Findus is this, he's basically a small child in a cat's body. All of the animals characters (With the exception of the Mcduff books) that appear in books made by Rosemary Wells. Spectral Shadows has a bunch of these in Serial 11. Going off the Synopsis Page on the Live Journal site, they're also slated to appear in other serials. The world of Alan Dean Foster's Spellsinger novels fall under this trope, with species that lack manipulative appendages (such as most hoofed mammals) falling more under  instead. The main character of The Straggler's Mask is some kind of a rabbit... dog... thing. The Wild Ones features an entire city filled with animals who can talk, wear clothes, run shops, and even be part of a gang. Yet said city takes place within a much larger human city, and the animals frequently have to worry about traps the humans put out and getting captured by animal catchers. Later parts in the story The Wind in the Willows like Toad's car and Toad Hall. In the spin-off to Kabouter Plop called Plop & de Peppers all three of the animal friends that is with Plop appear this way. The Magicians: Fillory has many, of every common species. Apparently many of them also have relationships with human Fillorians. With the exception of vocalist Ranko, every BUTAOTOME member has an anthropomorphic animal persona: Paprika is a cat, Comp is a polar bear and Ranko no Ane is a pink rabbit. Psalty: My dog is flying the plane?! Charity: I'm a mouse. What's the difference? Risky Rat, the go-to villain for the series, also appears to be this. In his visual appearances, he's covered in fur and has a tail. In Police Force, almost everyone is a Funny Animal, wearing little to no clothing and exhibiting natural body proportions. The only exceptions are the police officers, who are Petting Zoo People. Interstitial Actual Play has the party visit a Sonic the Hedgehog world and thus change form accordingly. Marche becomes a Cockatiel, Edith becomes a mouse, and Criss Angel becomes a bat. Subverted with Roxanne, who is already an anthropomorphic dog-person. She becomes human. The Onion published an excellent article based on this trope in the editorial section, titled "Stop Anthropomorphizing Me" , written by Gerald the Dog. Topo Gigio is an Italian franchise very popular in the Latin World about a funny mouse who uses different kind of clothes (including pajamas and a sleeping hat), lives in a house with proportionally made furniture and even has a miniature pet cat. Certain characters from GoGo's Crazy Bones are this trope. Case in point: Lucky Rab, an anthropomorphic rabbit. It'd be easier to list the few human characters in Animal Crossing as the sheer number of examples of funny animals in each entry in the series (including Japan-only villagers) put together could possibly fill up half of this page alone (let's just say the game's title is well deserved). The only human(s) in the games are the Player Character(s) and presumably their parents. Most of the characters in the Banjo-Kazooie series are this, including the titular bear and bird, Captain Blubber & Boggy. Beyond Good & Evil has these for most of the NPC's: Pig-men, shark-men, walrus-men, etc. Taking pictures of them with the camera names their species in the form of "[Species] Sapien." Beyond Good and Evil 2, a prequel to Beyond Good and Evil reveals that they were genetically engineered slave labor designed to withstand hostile alien environments. Bug. Most of the arthropod enemies in the game aren't, though. Crash Bandicoot, well, to an extent, with Ripper Roo and Tiny Tiger who averts this somewhat. In Creepy Castle, a good part of the cast are bugs like the hero, Moth. Crusader Kings II: Any number of Good Bad Bugs involving Glitterhoof and Horse M.D., a pair of horses added as randomly generated characters in the Conclave and Reaper's Due DLCs. By abusing a couple of loopholes in the rulesnote They both have a "Horse" trait that is supposed to prevent them from being landed or marrying and producing offspring with nominally human characters, but this doesn't stop you from educating children in Horse culture and then landing them, nor Catholic rulers from nominating them as heirs to bishoprics., you can generate entire dynasties of horses that are as playable as any other, leading to such utter lunacy as Empress Rainbow Dash of the (restored) Roman Empire . In Inherit the Earth the entire cast is like this, more or less, due to humans being extinct. Lugaru, its upcoming sequel Overgrowth features a cast full of these, and its heavily implied that the game takes place after the fall of mankind. In Odin Sphere, the Pooka are rabbit-folk the size of dwarves that talk and walk like humans. It makes sense seeing as they're actually humans who were cursed into that form. Pip the Rogue Alchemist is a vulpin, a species of humanoid fennec foxes who hail from a small agricultural village called Brightmarsh. While most vulpines are family-oriented and keep to themselves, Pip is an orphan with a desire to adventure outside his hometown. Pepper, a Distaff Counterpart to Pip, added in Battle Pass 3. Pepper comes from an alternate universe, and came into Pips Universe while he was experimenting in his workshop. While she is ostensibly just a very fancy skin for Pip, Pepper has unique character icons on related emotes and on the gameplay HUD, something no other character skin does. Because of this, the game treats the two as two seperate characters. Moji is a leipori, a humanoid rabbit species who are attuned to nature. While the rest of the leipori fled to the forests to avoid getting involved in the war raging across the Realm, Moji took it upon herself to summon the great nature spirits to defend the world. Humorously, she gets really excited about meeting Pip, complementing his fur and tail. Morgana from Persona 5 is a Talking Cat that sits in chairs, picks locks, shows you how to make thief tools like smoke bombs, and learns to be an auto mechanic in his spare time. In the Mental World of the Palace, he also turns into an anthropomorphized form that walks on two legs, fights with swords and slingshots, and wears a bandana and a Utility Belt. Several NPCs in Shovel Knight are anthropomorphized versions of such animals like horses, deers, peacocks, goats, roosters, frogs, hedgehogs, and rams. Shovel Knight himself may or may not be an anthropomorphic fish. Sly Cooper: Everybody most are humanoid animals, with some variants as deemed stylistically appropriate. The Contessa is the greatest departure, being a spider-centaur creature, while Arpeggio the parrot and Sir Raleigh the frog are essentially unmodified animals. Sonic the Hedgehog stars various Funny Animal characters who live alongside humans. Sonic's "animal friends" from the classic games are the exception (they're Partially Civilized Animals). Toontown Online is an MMORPG based around Funny Animals. TY the Tasmanian Tiger, much like Crash Bandicoot, both of them starring obscure Australian mammals. The majority of monsters in Undertale are anthropomorphized animals like goats, dogs, cats, fish, etc. Some of them play the trope fully straight while others are basically semi intelligent but still act mostly animal. Urban Rivals: Most of the cast is human, but all of the Jungo clan falls under this. Squeaker in Fleuret Blanc, a dog who acts exactly like a human except for the occasional bark. Le Neuvieme even says he is a "perfect French gentleman". Nobody except Kant finds this odd. '32 Kick-Up is a Fighting Series that takes place in a world of 1930's-style funny animals living alongside humans. In Alice and the Nightmare, Rougina is served by a pack of fluffy, bipedal, talking and clothes-wearing rabbits. Bug Pudding, with its inspiration firmly rooted in The Golden Age of Animation, breathes this trope. CHEVALIER is a romantic fantasy adventure that features a cast of Funny Animals. In Corgi Quest, anthropomorphic corgis seem to have filled the niche that humans normally fill. Carson the Muskrat from Dork Tower. He doesn't wear clothes note except for uniforms at work or costumes at conventions, but otherwise uses computers, gets jobs, drives cars, and functions socially like everyone else. The Dynamite Twins and Friends. Many of the characters, even in the larger KGC Universe as a whole, are animals. Most of them have little to no clothing. Most of the cast in Endtown, created from humans due to a mutating plague. The Fuzzy Princess is about a bunch of funny animals from a distant kingdom living with humans. In Harkovast, every character is a talking animal person, with each nation being made up of a particular animal. The only possible exception is the Nameless, whose species is indeterminate at the moment due to their all covering armour and helmets. Horndog: Creator Isaac M. Baranoff specifically states that Horndog and Here, Wolf are "Funny Aminal" comics. The KA Mics Mr. & Mrs. Rockhound cartoons have anthropomorphic dogs in place of humans. Lackadaisy is about a down-on-its-luck crime gang in Prohibition-era St. Louis. Oh, and they're all anthropomorphic cats. Loserz is not a furry comic, but occasionally Max and Cecil have an appearance. The pathologically enthusiastic sheep in Mr Square. The Skrii'qek of Nahast: Lands of Strife are a race of birds of prey who talk and act like humans. In the No Rest for the Wicked, Perrault is a Funny Animal — as opposed to the Talking Animal from the source Fairy Tale, Puss in Boots. Everyone in The Packrat except for the YouTube "celebrities" in the November 2010 strip ◊. Pinch is a food-themed Cyber Punk Dystopia with funny animal characters. Precocious features a large cast of "superintelligent" children that happen to be made up of anthropomorphic canines and felines. In Realm Of Owls the owl people's appearance follows owl anatomy for the most part, but they have some human-like attributes, such as hands instead of wings. It is also hard to tell genders apart, for the differences are as minimal as with most of the real-life owl species. Three Jaguars. The jaguars are also personifications of the artist's impulses. In Urban Underbrush, the two rabbits dress in clothing and run an explosive business. The rest of the animals are Talking Animals. VG Cats: Leo and Aeris are a pair of anthropomorphic cats. Their families are also anthropomorphic cats. When The Whiteboard started, only the main cast were funny animals, while almost all of the rest of the cast were no-neck bubbleheaded humans with no distinctive facial features. The artist later experimented with more realistic humans, but then around 2012 went with the entire cast being funny animals, converting fan favorites Larry and Daryl from bubbleheads to squirrels without any commentary on the change In-Universe. CollegeHumor: Deconstructed and played for laughs with "Narnia Dogs Can't Stand ", where the titular dogs not only try to stand but do other human things even though it's really unnecessary. When the children aren't looking they go right back to doing things like sniffing each other's butts or licking themselves. Every character in Alfred J. Kwak, barring a rather beastlike human. All citizens of Elmore in The Amazing World of Gumball are Funny Animals/Food/Objects/Whatevers. Species is reflected in their behavior to various degrees, but all of them live in houses, have jobs, and send their children to school like humans. The entire cast of The Angry Beavers. Even the humans in the show are treated as such. Like Around the World with Willy Fog, Around the World in 80 Days (Burbank Animation) takes place in a world of anthropomorphic animals. Unlike Willy Fog, however, Passepartout is a monkey and Phileas Fogg is a fox. Many characters in Bojack Horseman including the eponymous equine. Plenty of humans too though. Chip 'n Dale Rescue Rangers straddles the line between this and Talking Animal, with a healthy dose of Furry Confusion for good measure. The main cast usually falls squarely into Funny Animal territory, though at times might slip into Talking Animal (Chip and Dale more than the others, as they will sometimes run on all fours like actual chipmunks. Monterey and Gadget almost never behave like actual mice). Most other rodents in the series are also portrayed fairly consistently as Funny Animal. Cats generally tread both sides, while dogs and almost everything else tend to be Talking Animal exclusively. Furry Confusion occurs with pretty much everything, particularly fish and incidental or background characters. Most of the "core" stars of the Classic Disney Shorts - Mickey Mouse, Donald Duck, Goofy, and so on. 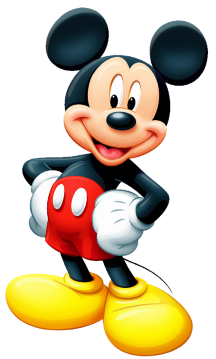 Pluto would be an exception, however; as Mickey's pet dog, he's a Nearly Normal Animal. British children's series Go Jetters features an anthropomorphic disco-grooving unicorn named Ubercorn as the mentor and leader of the otherwise all-human Go Jetters team. Many Hanna-Barbera characters from the 1960s and some later are Funny Animal characters. Including Yogi Bear, Quick Draw McGraw, Wally Gator and so many others. Harvey Beaks: With the exceptions of Fee and Foo, most of the cast is some sort of anthropomorphic animal. While 90% of the Jimmy Two-Shoes cast are monsters and demons, this trope is surprisingly common. The two most prominent being the Weavils and the Schwartzentiger. We've also seen pandas, a goat, a rhino, a crab, and an ape. On Joe and Jack, Jack is a cat, but walks and behaves just like a boy and in practical terms seems more like a brother of Joe of about the same age, or maybe a little younger. His character model even looks a lot like Joe, except different coloring, whiskers, cat ears and a tail. Enhancing the resemblance is that Joe wears a full-body costume of an animal all the time. Porky Pig is consistently show living and working among humans, with A Corny Concerto even giving Elmer's usual role as the one hunting Bugs. Porky is probably like this because he was created earlier than most other Looney Tunes (who tend to be Civilized Animals), in an era when Disney had made Funny Animals universal. Daffy Duck varies a lot between a Civilized Animal living in the woods or a pond and a Funny Animal living among humans, often as Porky's neighbor, partner, or similar. Bugs Bunny straddles the line between Funny Animal and Civilized Animal. He has been moving steadily towards the Funny Animal Camp over the years. In The Looney Tunes Show, he is almost completely a Funny Animal, with a large suburban house, a Prius, and a good income stream through royalties from his inventions. Wabbit: A Looney Tunes Production moves him back to being a Civilized Animal living in a hole in the ground. Los Trotamúsicos are a band of domestic animal musicians. What's more funny than that? One-off antagonist Zeb (a zebra) from My Little Pony 'n Friends. Rather jarring given that most of the cast are also equines, but are not anthropomorphized to the extent Zeb is. My Little Pony Tales: The characters may look like My Little Pony ponies, but their behaviors and concerns are human. You know you're dealing with a Slice of Life show about human-like characters when the kids stand around discussing their problems with their parents as they wash the dinner dishes. Most of the characters in Pig Goat Banana Cricket are either this or a human, with the exception for Banana. Popeye encountered one of these in "The Hungry Goat". The short overall felt like more of a Tex Avery cartoon than a Popeye cartoon. Funny animals are featured prominently in "Popeye The Sailor" and "I Eats My Spinach". Fleischer Studios was known to use these in the Betty Boop cartoons, where the Popeye series branched out of. Of note is that in the Regular Show universe, everybody who can talk is considered human, and nobody really seems to question it. Many of the characters of Rocko's Modern Life. A few non-animal (nor human) characters show up from time to time. The Shnookums & Meat Funny Cartoon Show: Schnookums and Meat themselves, plus many of the characters on the Pith Possum segments. Scrub Me Mama With A Boogie Beat is an odd case. Due to the era it was released in, it features a cast of African-Americans who are drawn to heavily resemble chimpanzees. The cast of SpongeBob SquarePants consists mostly of anthropomorphized sea creatures. The cast of TaleSpin. Baloo started as a Talking Animal living in the jungles of India and wound up an Anthro flying a plane and living in a city. Hamton J. Pig from Tiny Toon Adventures, being based on Porky, is the only animal member of the cast who lives in a completely human house, even though it's next to the mud piles of other pigs. Otherwise, the cast tend more toward Funny Animals than the original Looney Tunes, as they attend school (albeit for an education on being a cartoon character), frequently use urban facilities like stores, and are shown socializing with each other in a non-hostile context. The main characters of We Bare Bears, They look like bears, they walk on four legs sometimes, and they live in a cave, but they otherwise act human. Most actual humans in the show don't see anything odd about this. Notable that they are, in fact, recognized as bears since they befriend Chloe after she studies them for her college project on bears. They've also been known to act like wild bears under times of stress, such as when Grizz decides they need to become more primal. On Wild Animal Baby Explorers, the cast members are basically this, given their speech, use of technology and their general concerns of exploring and learning. They're Wild Animal Baby Explorers because it's wild animals that they're exploring, not they themselves that are wild animals.